Hi, I am interested in your 1972 Buick Skylark (stock #4794-CHA) listed on Autotrader for $24,995. I'd like to get more information about this vehicle and confirm its availability. 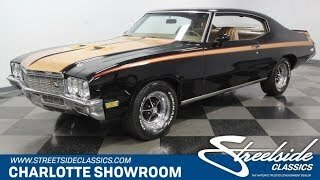 This 1972 Buick Skylark gives you a ton of great GSX flair. And backing it all up is big V8 power and a ton of thoughtful upgrades... but the most appealing part of this package is you get it all for such an obtainable price. From the outside you can instantly tell youre looking at something special. This Buick does a terrific job of looking both premium and sporty, and that all has to do with the design. The long pointed hood, well-creased fenders, and hardtop profile are exactly the same that gave the GSX their appeal, and so you love them on this tribute. Plus, the black and gold two-tone on this one is timelessly eye-catching. It sets up the full aggressive package that includes the dual hood scoops, hood pins, and red inserts behind the rear set of Buick Rallye wheels. We know you noticed the red pinstripe that draws even more attention to the tapering side stripe that also seamlessly continues over the rear with the added spoiler. So yes, this is a thoughtful total package. Inside is the same upscale performance attitude. The original saddle tan color of the interior looks amazing. The bucket seats have a button-top presentation and good bolstering to really drive home this Buicks luxury and performance dual nature. This has all the right space and comfort to take family and friends along for the ride. It even includes features like power windows, power locks, an upgraded AM/FM/CD stereo, and provisions for air conditioning. While this is luxurious, youll love the performance pieces like the B&M shifter and full Dakota Digital gauge upgrade subtly adding a full info package to the original readouts space, including a large tach. This one is also made to impress under the hood. People will love to see the bold Dante red block, plenty of polished components, and a true Stage 1 intake that mean the hood scoops are for more than just show. Plus, the investments in the motor were also about power. Buicks own 350 cubic inch V8 provides big torque from a small package, and thats upgraded further with a Holley four-barrel carburetor and Dougs Headers feeding the stainless Flowmaster dual exhaust. Plus, you have all the right supporting components from the Derale aluminum radiator w/electric fans to keep it running cool, to the 2500 RPM stall on the three-speed automatic to keep you in the optimal powerband. Add in power steering, front disc brakes, and Firestone Firehawk tires, and you soon realize this growling V8 machine is also an easy cruiser. This is the perfect mix of luxury and performance, so at a price like this, you know you need to hurry if you want to take this GSX tribute home. Call now!